TR Jain & Vk Ohri (2017) Solutions for Class 11 Science Economics Chapter 10 Measures Of Central Tendency Median And Mode are provided here with simple step-by-step explanations. These solutions for Measures Of Central Tendency Median And Mode are extremely popular among class 11 Science students for Economics Measures Of Central Tendency Median And Mode Solutions come handy for quickly completing your homework and preparing for exams. All questions and answers from the TR Jain & Vk Ohri (2017) Book of class 11 Science Economics Chapter 10 are provided here for you for free. You will also love the ad-free experience on Meritnation’s TR Jain & Vk Ohri (2017) Solutions. All TR Jain & Vk Ohri (2017) Solutions for class 11 Science Economics are prepared by experts and are 100% accurate. Therefore, the median marks in the economics paper is 23. Hence, the median height is 145 cm. Hence, the median weight is 71.5 kgs. It shows that median value corresponds to the 75.5th item in the series. This item appears first of all in 95th cumulative frequency of the series. Therefore, median shall be the value corresponding to the 95th cumulative frequency, which is 35. Therefore, the median value will be 35. It shows that median value corresponds to the 100.5th item in the series. This item appears first of all in 135th cumulative frequency of the series. Therefore, median shall be the value corresponding to the 135th cumulative frequency, which is 48 paise. Therefore, the median value is 48 paise. 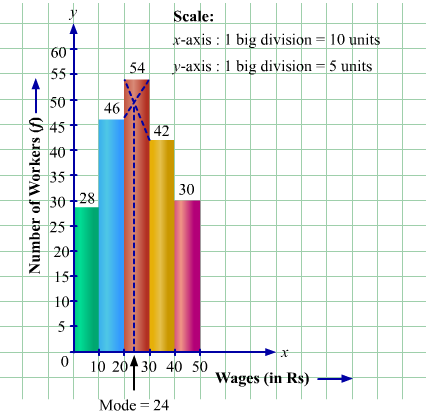 Find out median marks of the following marks distribution for 100 students. Hence, the median marks is 23. Converting the Cumulative frequency of 'less than' type into a simple frequency distribution. The 50th item lies in 62th cumulative frequency of the series. The corresponding class interval, 30-45 is, therefore, the median class interval. Converting the Cumulative series of 'less than' type into a simple frequency distribution. 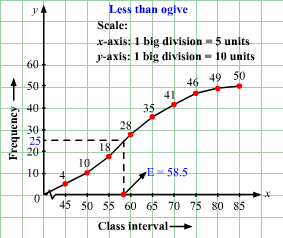 Hence, the median value of the above series is 21. This is an inclusive series given in the descending order. It should first be converted into an exclusive series and placed in the ascending order. Hence, the median value of the above series is 39. Coverting the Inclusive series into exclusive series. In order to find the mode in an individual series we first need to arrange the series in an ascending order i.e. Hence, Mode (Z) of the above series is 7. Weight of 50 students is given below. Calculate mode. An inspection of the series reveals that 50 is the value with highest frequency of 20. Hence, 50 is the Mode (Z) of the series. Analysis table shows that of all the class intervals, 12 − 16 has the highest frequency of 5. It has got the maximum (✓) marks. Accordingly, 12 − 16 is the model class interval of the series. Hence, the mode (Z) of the above series= 14.67. A glance at the above table reveals that 149.5 − 179.5 is the model class interval as it has the highest frequency i.e.18. The following data-set gives mid-values and frequencies. Calculate its mode. As class interval 22.5 − 27.5 is the one with highest frequency. Therefore, this is the modal class interval. Median and mean values of the marks obtained by the students of a class are 46.67 and 45.5 respectively. Find out mode of the marks. Median and mean weight of the students of a class are 35.83 and 37.06 respectively. Calculate the mode. Hence, the mode weight of the students of a class is 33.37 kgs. If median and mean of a distribution are 18.8 and 20.2 respectively, what would be its mode? 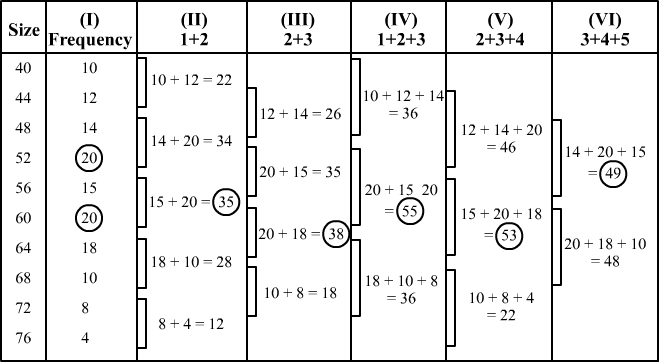 Hence, mode (Z) of the above distribution is 16. Present the following information in the form of a histogram and locate the modal value. Give a cross-check to your answer, calculating mode through its standard formula. Mode (Z) value is 44. Hence, Mode (Z) is 44. 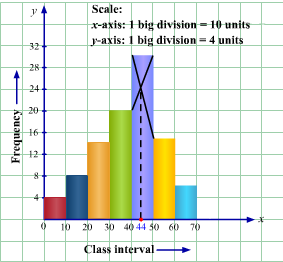 Find out mode of the following distribution, using histogram. Find out mode of the following data with the help of histogram. Given below is the data of the age of 9 children of a street. Find the median. 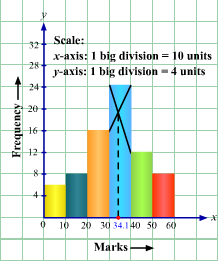 Therefore, Median of the data so given is 5. Therefore, Median of the data so given is 25.
or, Median = size of 742th item = size of 37th item. Now, we need to locate this item in the column of Cumulative Frequency. The item just exceeding 37th is 40 (in the c.f. column), which is corresponding to 6. ​ Hence, median is 6. Data relating to wages of some workers are given below. Find out median wage. Median class is given by the size of N2th item, i.e.702th item, which is 35th item. This corresponds to the class interval of 30 − 40, so this is the median class. The following table expresses the age of eight students. Find the median age. This is an individual series, hence, first of all, we need to arrange the data in the ascending order. Here, the number of observation is 8 (even). Number of persons living in a house is reported to be as under 500 houses in a village. Find the median number of persons in a house in the village. Now, we need to locate this item in the column of Cumulative Frequency. The item just exceeding 250.5th is 259 (in the c.f. column), which is corresponding to 3. Now, we need to locate this item in the column of Cumulative Frequency. The item just exceeding 40.5th is 50 (in the c.f. column), which is corresponding to 25. Distribution of marks obtained by 100 students of a class is given below. Find out the median marks. Now, we need to locate this item in the column of Cumulative Frequency. The item just exceeding 50.5th is 78 (in the c.f. column), which is corresponding to 30. Median class is given by the size of N2th item, i.e.302th item, which is 15th item. This corresponds to the class interval of (25 − 35), so this is the median class. Median class is given by the size of N2th item, i.e.502th item, which is 25th item. This corresponds to the class interval of (15 − 20), so this is the median class. Median class is given by the size of N2th item, i.e.1502th item, which is 75th item. This corresponds to the class interval of (30 − 35), so this is the median class. This corresponds to the class interval of (40 − 45), so this is the median class. Median class is given by the size of N2th item, i.e.8002th item, which is 400th item. This corresponds to the class interval of (35 − 40), so this is the median class. Median class is given by the size of N2th item, i.e.282th item, which is 14th item. This corresponds to the class interval of (30 − 40), so this is the median class. For the calculation of median, the given mid-values must be converted into class intervals using the following formula. The value obtained is then added to the mid-point to obtain the upper limit and subtracted from the mid-point to obtain the lower limit. In this manner, we obtain the following distribution. Calculate mode of the following series using the graphic technique. Counter check the modal value with the formula. By inspection, we can say that the modal class is 20 – 30 as it has the highest frequency of 54. The data given in the question is a discrete series. Therefore, using the inspection method of ascertaining mode, we know that the item which repeats itself the maximum number of times is regarded as the mode of the given series. In this manner, 75 is regarded as the modal value, as it has the highest frequency (of 9 times). By inspection, we can say that the modal class is (30 – 35) as it has the highest frequency of 7. For the given distribution, the grouping table is as follows. On the basis of this grouping table, an analysis table is prepared. For each column of the grouping table, we analyse which item/group of items correspond to the highest frequency. From the analysis table, it is clear that 60 repeats the maximum number of times. Thus, mode is 60. 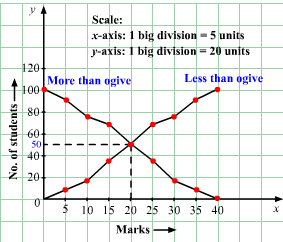 Note that the given distribution is in the form of inclusive class intervals. For the calculation of mode, first the class intervals must be converted into exclusive form using the following formula. The value of adjustment as calculated is then added to the upper limit of each class and subtracted from the lower limit of each class. 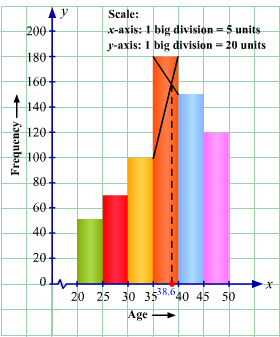 In this manner, we get the following distribution. By inspection, we can say that the modal class is (49.5 – 59.5) as it has the highest frequency of 263. By inspection, we can say that the modal class is (15.5 – 20.5) as it has the highest frequency of 50. To calculate the value of mode, we first convert the given less than cumulative frequency distribution into a simple frequency distribution as follows. By inspection, we can say that the modal class is 60 – 70 as it has the highest frequency of 71. The data given in the question is a discrete series. Therefore, using the inspection method of ascertaining mode, we know that the item which repeats itself the maximum number of times is regarded as the mode of the given series. In this manner, 5 is regarded as the modal value, as it has the highest frequency (of 20 times). Therefore, mode (Z) is 5. Now, we need to locate this item in the column of Cumulative Frequency. The item just exceeding 250.5th is 259 (in the c.f. column), which is corresponding to 3. ​ Hence, median is 3. The data given in the question is a discrete series. Therefore, using the inspection method, we can say that 3 is mode of the given series. This is becasue 3 has the highest frequency of 120 times. Therefore, Mode (Z) is 3. Median class is given by the size of N2th item, i.e.1592th item, which is 79.5th item. By inspection, we can say that the modal class is (30 – 40) as it has the highest frequency of 45. This corresponds to the class interval of (35 − 45), so this is the median class. 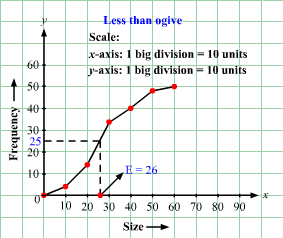 Median=l1+N2-c.f.f×iso, Median=35+8002-220180×5or, Median=35+180180×5or, Median=35+5Thus, Median is 40. Median class is given by the size of N2th item, i.e.1002th item, which is 50th item. By inspection, we can say that the modal class is (30 – 40) as it has the highest frequency of 25. Calculate median in an asymmetrical distribution if mode is 83 and arithmetic mean is 92. Recalling the empirical relationship between mean, median and mode, we can express it algebraically as below. Substituting the given values in the formula. Calculate mode when arithmetic mean is 146 and median is 130. If mode is 63 and median is 77, calculate arithmetic mean. This corresponds to the class interval of 40 − 50, so this is the median class. By inspection, we can say that the modal class is (50 – 60) as it has the highest frequency of 30. Mode (Z)=l1+f1-f02f1-f0-f2×ior, Z =50+30-22230-22-28×10or, Z=50+860-50×10or, Z=50+810×10or, Z=50+8=58Hence, mode (Z) is 58.